As debut records go, this one did catch me off guard a bit. Typically, debut discs, especially by saxophonists, often go for the jugular, in an attempt to remove all doubt concerning the leader’s legitimacy as a leader. Most importantly, demonstrating one’s chops and versatility becomes the central priority. The best example from last year would be Kamasi Washington’s The Epic, an exceedingly ambitious triple-disc release that all but shouts for recognition at every turn through Washington’s forceful playing and the stylistic range of his composing (as well as the over-the-top song titles: if one’s first track is called “Change of the Guard” you’d better have something to say). 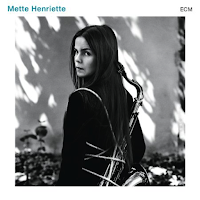 But this self-titled, two-disc release by Norwegian saxophonist Mette Henriette Martedatter Rølvåg (or simply Mette Henriette as she prefers to be called) is quite different. Rather than trying to overwhelm the listener with her prowess on the instrument, she instead chooses a more inviting approach—drawing the listener into the record, by almost imperceptible subtleties, only to reveal her technical proficiency gradually in less overt ways. In the process she creates an intriguing, and rather beguiling, debut statement. It is perhaps most telling that Henriette’s musical background lies in free jazz rather than straightahead or traditional jazz. Her interests lie more in the texture of sound and ego-less collaboration than in the typical head-solo-head framework (with emphasis on the solo, of course) that is so common, particularly in the States, for training young musicians in the fundamentals of jazz. A result of this is that on most of the cuts of this record, one would have no idea who the “leader” is. (Indeed, Henriette doesn’t even play on a number of them.) Melodies are as likely to be presented and developed by the other instruments as by Henriette, who is often content merely to float over the top of the music, sometimes by filling in harmony or adding breaths, tones and sounds rather than playing the core of the tune. And for that matter, the cuts on this album aren’t really “songs,” but rather melodic fragments, sometimes very short, with over half of them under two minutes. Compositional complexity isn’t the goal here, but rather the careful, deliberate articulation of a particular musical idea or figure. The first disc is a trio, with Henriette complemented by Johan Lindvall on piano and Katrine Schiøtt on cello. These 15 pieces are the most effective on the record, with the subtle interplay of the three musicians disarmingly affecting. Lindvall shares Henriette’s “less is more” aesthetic, being content to play repeated patterns rather than look for opportunities to display dazzling technique. And Schiøtt’s contributions are similarly effective, whether providing pizzicato counterpoint or bowed passages. There’s also a great deal of silence on this disc: opportunities to take in the sheer beauty of just a few notes, gracefully played. A nice example is the suitably titled “The Void,” in which Lindvall’s two-note piano figure is shaped by quiet, episodic bowing from Schiøtt and sustained single notes from Henriette. The second disc, with a larger ensemble including Lindvall and Schiøtt but adding a string and horn section, isn’t quite as gripping, largely because the 19 pieces feel a bit disconnected, lacking the cohesion of the first disc. Some of the tracks are more conventionally jazz-based, while others have more of a contemporary classical feel. It also seems as though Henriette didn’t know at times quite what she wanted to do with the larger tonal palette on this disc; the miniature fragments and figures used by the trio didn’t translate quite as effectively to the larger group setting. Even so, there are a number of interesting moments to savor here as well, as for example on “Veils Ever After,” where just the strings sketch out a haunting passage, or “I,” a slow-developing but powerful piece in which the entire ensemble provides a post-bop structure over which Henriette’s compelling and fiery solo reveals that yes, she can show off a bit when she needs to. Henriette is someone to keep track of in the future, for sure. A very promising release. Great review, Troy! I can't recall how exactly, but somehow I stumbled onto the EPK for this album today. It had completely passed me by. Your review definitely has me interested though. Thanks, Lee. It is definitely worth checking out--the first disc in particular really grabbed me after a couple listens. One of the best jazz records I've heard in 2015. She refuses to show off how good good her playing is, the most important thing w.r.t. this record are the really outstanding compositions.